The activity in the secondary bond market was at a virtual standstill yesterday as yields increased on the back of widening two way quotes. 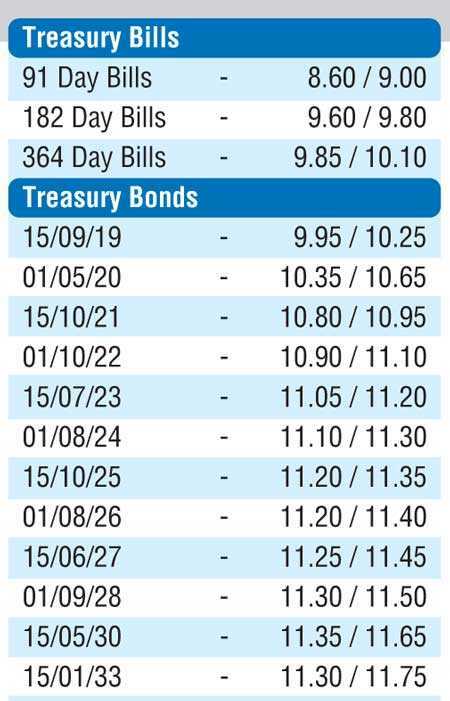 Limited trades were seen on the 10-year maturity of 01.09.28 as its yield was seen increasing to an intraday high of 11.50% against its day’s low of 11.35% while the 15.03.25 and 01.06.26 maturities changed hands at 11.12% and 11.20% respectively. On the short end of the curve, the 01.03.21 and 15.12.20 maturities were seen changing hands at levels of 10.82% to 10.85% and 10.70% respectively. Today’s weekly bill auction will have on offer a total amount of Rs.11 billion, consisting of Rs. 4 billion of the 91 day maturity and Rs. 7 billion of the 364 day maturity. At last week’s auction, all bids received were rejected. The total secondary market Treasury bond/bill transacted volumes for 8 October was Rs.14.73 billion. In the money market, the OMO Department of the Central Bank of Sri Lanka injected an amount of Rs. 9.05 billion on an overnight basis by way of a Reverse Repo auction at a weighted average rate of 8.24% and a further amount of Rs. 4 billion by way of a seven-day reverse repo auction at a weighted average of 8.26% as the net liquidity shortfall in the system increased to Rs. 24.97 billion yesterday. Furthermore it injected an amount of Rs. 11 billion by way of a 14 day reverse repo auction at a weighted average of 8.21%, valued today. The overnight call money and repo rates averaged 8.41% and 8.30% respectively. The USD/LKR rate on its spot contract depreciated further yesterday to close the day at Rs. 171.00/30 against its previous day’s closing of Rs. 170.65/80 driven by importer demand. The total USD/LKR traded volume for 8 October was $ 18.55 million. Given are some forward USD/LKR rates that prevailed in the market: one month – 172.20/60; three months – 174.20/60; six months – 177.00/50.